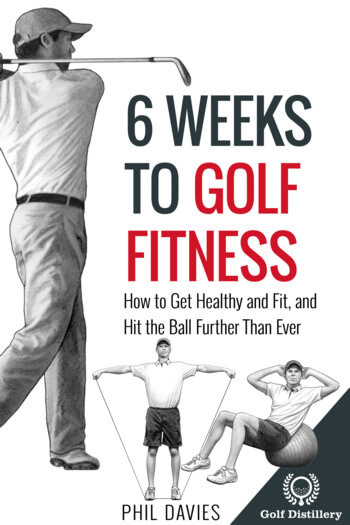 The way fingers are positioned on the actual grip of the club has an immense impact on the path the club will take around your body and ultimately the direction and flight of the golf ball. While its effects are often overlooked in favour of the swing proper, serious golfers should carefully position their hands on the grip of the club before each and every shot and treat that process as an integral part of the golf swing. 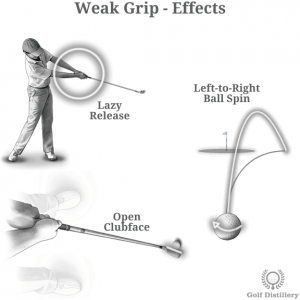 Here are several of the grip tweaks available and their corresponding effects. 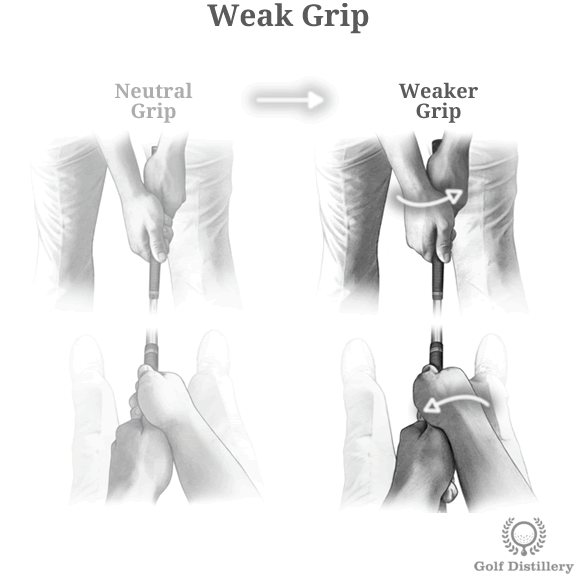 The way fingers are positioned in relation to the center of the grip is referred to as the relative strength of a grip. Indeed, they can be placed in the middle for a neutral grip, or towards the right for a strong grip and finally to the left for a weak grip. 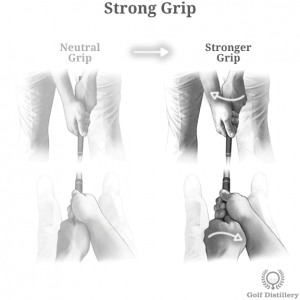 A neutral grip sees both of your hands around the center of grip, not leaning towards any side but rather being located on the top of the grip. 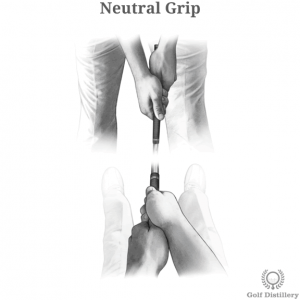 First grip the club with your left hand making sure that when you do and when the clubface is square to the target you can see two and only two knuckles when looking down. These would be the top knuckles from your index and middle fingers. With your left hand firmly in place, place your right hand below it and in such a way that it is opposite your left hand. 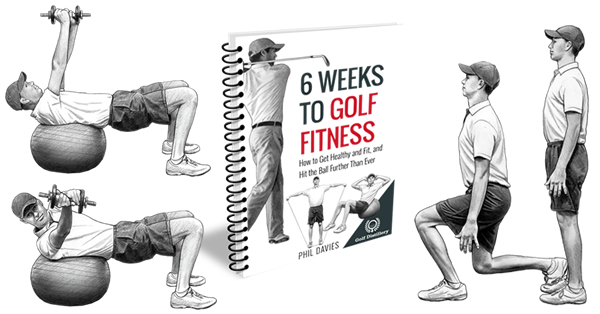 Indeed, for all grip strengths, you’ll want both palms of your hands to be effectively facing each other on opposite sides of the grip. If you’ve done it correctly, the Vs formed by your thumbs and index fingers should be pointing slightly to the right of your nose. 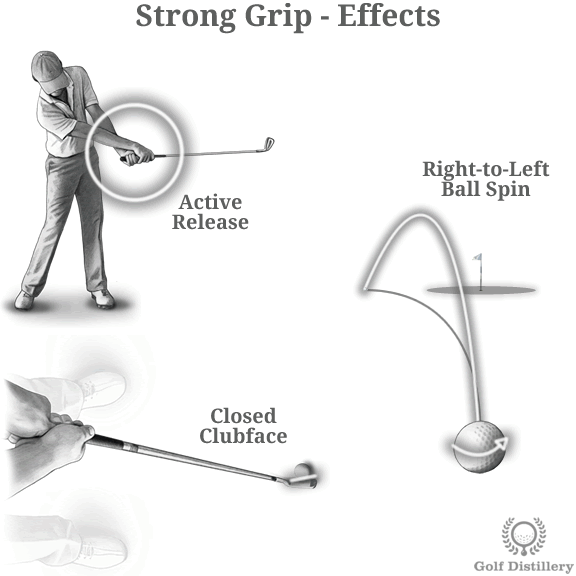 As its name implies, a neutral grip doesn’t favour one side or the other but rather a straight ball flight. Indeed, combined with a sound swing a neutral grip will have a natural tendency to reach back towards impact in a square position. What would be called a strong grip will see both of your hands leaning to the right of your grip (when looking down). This is in contrast to being more or less in the middle of the shaft. 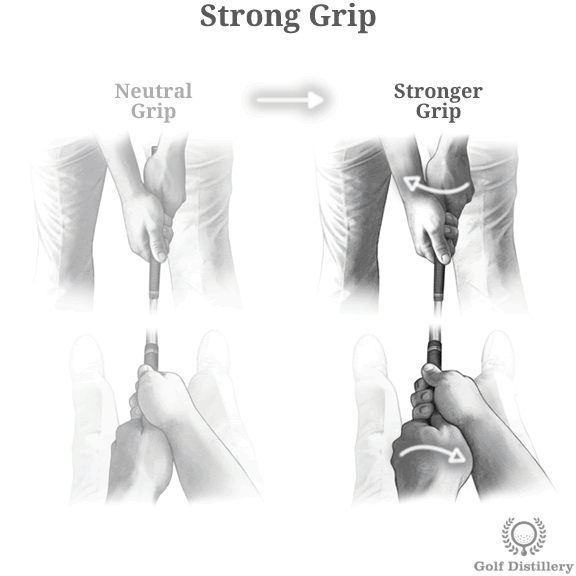 First grip the club with your left hand making sure that when you do and when the clubface is square to the target you can see exactly three knuckles. These would be the top knuckles of your index, middle and ring fingers. With your left hand in place, position your right hand below it and in such a way that both palms are effectively facing each other from opposite sides of the grip. If you’ve done it correctly, the Vs formed by your thumbs and index fingers should be pointing towards your right shoulder. All other things being equal, a strong grip promotes an active release of the hands at impact, meaning that hands are encouraged to fully roll into impact. 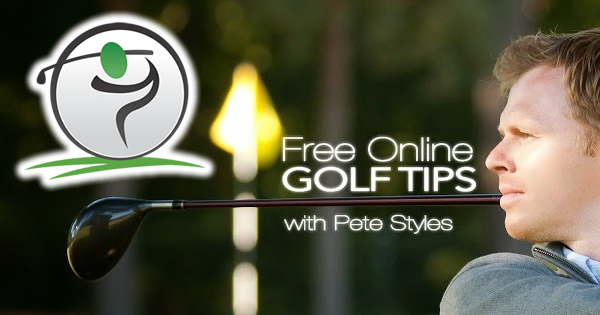 This natural ease in releasing favours a clubface that is more closed than otherwise. And ultimately, a closed clubface at impact will transfer right to left sidespin into the ball, resulting in a ball that will draw or hook. A weak grip is one where both hands are positioned to the left of the center of the grip slightly, when looking down. Or at least left of the center of what would be a normal, neutral grip. First grip the club with your left hand while making sure that when you do and when the clubface is square to the target only one knuckle is visible when looking down. The knuckle in question would be the one from your index finger. With your left hand securely in place, position your right hand below it in such a way that it is opposite your left hand. Indeed, both hands should more or less face each other, a statement that is true for all grip strengths. If you’ve done it correctly, the Vs formed by your thumbs and index fingers should be pointing towards your left shoulder. All other things being equal, a weak grip promotes a lazy release of the hands at impact, meaning that hands are restricted from fully rolling into impact. This difficulty in releasing favours a clubface that is more open than otherwise. And ultimately, an open clubface at impact will transfer left-to-right sidespin onto the ball, resulting in a ball that will fade or slice.